Well we have officially passed our first month of being open. We are starting to feel we are getting the hang of things (starting) and are now hardly ever making a mess of our stock orders (hardly), like mysteriously receiving several copies of things we don't even remember ordering and suddenly having zero books in stock of our bestselling authors. Duh. Anyway, we did plan to open rather quietly so we could practise our novel bookselling skills on just a few unsuspecting people, who have been very wonderful and kind and patient as we look goggle eyed at the till and realise we have no Philip Pullmans. Duh again. However, now we have actually started getting complaints from people for not making greater effort to let people know we are here, we have taken steps. Our first step came in the form of a local journalist, who came along today with her mum, who bought some books and settled down in our fabulous Penguin "The Garden Party" deckchair (in our window) and said it was so comfortable she fell asleep. We expect sales to rocket, and may hire her to sit there full time. Our friendly local journalist listened very charmingly as we went on, literally, for hours, about how totally wonderful it is to open a bookshop. There is always a point when talking to anyone with a tape recorder where you suddenly wonder what on earth you just said and knowing it's going to sound pretty stupid. 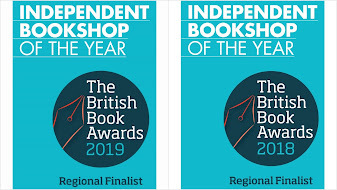 And there is definitely a danger when we talk about the bookshop that we do sound like a couple of overexcited schoolchildren who are just having the best time in the world. So apologies and thanks for this morning. We were lucky that the lady who came to interview us shares an equal enthusiasm for books and had some great contacts. We really hope to approach some of the lesser known local authors to head up our events list. (Local authors beware - we know who you are.) Our first event, as mentioned previously, will take place next Thursday and is partly an official opening and mostly a thank you to all those wonderful people who have stepped into our shop and made the whole experience come alive for us. We are hoping for a good turn out and good weather so we can make the most of our courtyard garden. We have also invited our local MP - Dr Evan Harris - who was at the local Chamber of Commerce breakfast meeting yesterday morning. After the event finished, he came up to the shop and bought/ordered some books (I promised to make it clear they were presents for his long-suffering researchers and assistants!). We were really honoured. Evan is a genuinely nice guy, and an MP who is very well-respected both locally and within Westminster. He also has an excellent taste in books I'm bound to add. (I have, incidentally, been mistaken for him twice. Both times were in B&Q in Abingdon bizarrely. Perhaps it's the lighting?) And then somebody else suggested today that we invite the Mayor, which we then did (we'll find out next week if he's coming, but with six days we can't blame him if he can't make it). So all in one day we seem to have expanded from opening in a very quiet way to being interviewed by the press and having the possibility of having both the local MP and the mayor at our opening do. Which is all rather good news as we did have some bad news the week. It was a bit of a bombshell actually - apparently a group from Waterstones was in Abingdon a few weeks ago investigating the feasibility of opening a bookshop . . .
As to the possibility that your opening is being used by Waterstones as a research vehicle to assess market demand for their own bookstore in Abington: yes. You've been conducting market research on their behalf. You should tell your newfound political contact that you would like to secure your survivability in case of corporate competition by buying a building. You should request assistance in researching the real estate market. Because you've just opened this is probably the very very very last thing on your minds. But in fact this exact moment may be the best time to be thinking about buying a building with storefront. You surely don't have enough money to make a downpayment on a commercial building, but don't worry about this. Ask the politico for advice and help. Remember that bookstores increase the real estate values for neighborhoods that surround them. So it may be possible with some help forming contacts among local real estate investors for some sort of consortium to form around you that would invest in or lend to you in your efforts. You've invested very little, relatively speaking, in your current buildout. So you could move without too much financial turmoil, if your newfound customer base is engaged in assisting you. My book was published by a bookstore/publishing firm that I helped to launch, in Brooklyn. The company had no cash at the time we needed to pay the printer to print my book. A customer at the store, who is turned out to be a Brooklyn real estate investor and who had become a regular customer fronted the money to print my book! In exchange he owns a small part of the company. In other words, the customers you have been serving for the past month include people who have assorted levels of disposable assets -- some of these people may be viable investors for you. Waterstones is definitely out for blood. I competed with them in Chicago: they opened a store a few miles from my store in 1991 and had an immediate impact on sales. If you shore up your position by becoming not just a bookstore, but an investor in local real estate, then when they come to town, and drive up the property values, you'll be making money off of THEM. The best defense is a good offense. Start telling everyone that Waterstones is possibly coming to town and you want their advice for how to survive. You may be able to innoculate your customer-base to the all-too-common tendency among indie-bookstore lovers to destroy their favorite indie bookstores by randomly, passively beginning to give their business to chains, in a completely unconscious casual manner. Do you think I could get Ken Livingstone down to our next poetry night? Good luck guys! Indy Booksellers of the world unite and all that. Waterstones! I spit in their general direction. The bane of every small publisher under the sun ... I'll stop there before I get libellous. Anyway, I honestly can't imagine where a Waterstones would go in Abingdon. Fingers crossed, and see you on Thursday. There is no way the likes of Waterstones can compete with you on charm or friendliness - keep on doing your thing - I predict a bright future! And it's not just Waterstones who will be watching you.When I first wrote about The Rebel Bookseller it wasn't in stock at Amazon UK. It was a week later. This has happened countless times. Anyhow, congratulations and welcome to the club, particularly the subsection, husbands and wives who booksell and blog. I work in Abingdon and had no idea there was a bookshop other than 'The Bookstore' around. I find 'The Bookstore' to be pretty lacking in, well, books! the shelves are always half empty. I tend to get my books online as I hate Oxford and as Abingdon has been, until now, lacking! You are probably safer now than you would have been when Ottakars was Ottakars. They really were the predators. 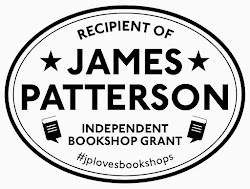 They opened in countless small market towns where there was already a thriving indie bookshop because they could see it worked - they opened next door or opposite and put the indie out of business within 6 months. Waterstones opened in much lrger places and even now I honestly doubt if they would find Abingdon big enough. But just keep your eye on WHS.. they ae expanding their books very considerably. Make sure you stay very different from them, as I`m sure you will. P.S. The people who want J Clarkson will buy him in WHS as they ae people who don`t read proper books and would be scared of your shop.. buying a book in WHS is nice and safe and anonymous.